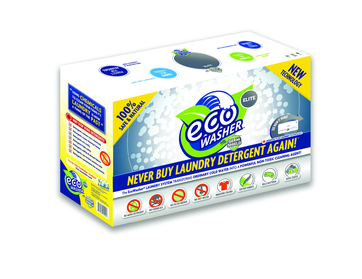 EcoWasher® is a detergent free laundry system designed to work with your residential washing machine. Ordinary cold water is transformed into a 100% natural, powerful and safe oxidizer that deep cleans, disinfects and deodorizes laundry. EcoWasher® has been shown through third party testing to kill 100% E. coli bacteria within just five minutes, as well as severely diminish the presence of many other dangerous bacteria! EcoWasher® quickly pays for itself by reducing costs on hot water, energy consumption, detergent and other toxic additive purchases, and creating an overall healthier lifestyle. Not only will you and your clothing benefit, but so will your washing machine! Toxic residues in your washing machine and wastewater will be annihilated, leaving a smaller footprint on the environment. 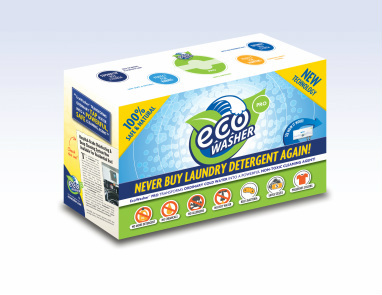 The EcoWasher® is 100% natural and safe detergent free laundry system that can be used with your existing washing machine. EcoWasher® contains no chemicals or toxic additives, and it's safe for sensitive skin, infants and chemical allergies. The EPA states that the chemicals contained in laundry detergents such as formaldehyde and other carcinogens (cancer causing agents), lead to a long list of negative health effects. In addition to these health risks, the environment suffers from detergents as well. Every year over 30 billion gallons of toxic laundry detergent wastewater is dumped into our waterways. Add to that the big, bulky plastic detergent bottles cluttering up landfills. It's time for a change! With EcoWasher®, no more polluting rivers, lakes and streams that detergents pollute, and plastic waste will be greatly reduced. Now imagine a world with no more detergent - just pure, clean laundry that reduces your carbon footprint. That is just within the first 5 minutes when using the EcoWasher®, and the best part is that the EcoWasher® attaches to any existing washing machine. 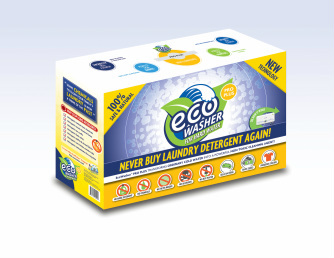 With up to $700 in savings a year, EcoWasher® eliminates the need for laundry detergent, fabric softener and hot water. 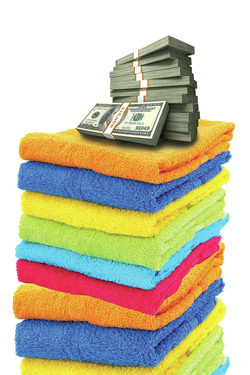 In addition to saving money on laundry supplies, the lifespan of your washing machine and clothing is effectively prolonged, saving even more money. With no wear and tear from detergent residue and no shredded fibers, your fabrics will last longer and stay looking brand new. Simply eliminating these dangerous chemicals from your laundry by using the EcoWasher®, you are savings thousands of dollars throughout a lifetime. EcoWasher® provides a deeper clean than ever before. With a simple 10 minute installation, EcoWasher® makes it easy for anyone to hook up. The unit simply mounts on the wall behind any washing machine. It has one inlet for cold water to enter and one outlet for oxidized water to exit into your washing machine to deep clean your laundry. There are no buttons, dials or settings to press. Once attached to your existing washing machine the EcoWasher® works automatically - just set your dial to cold wash and press start. That's it. EcoWasher® Testimonial: A Skeptic Becomes A Believer! My name is Bambi Summers. I'm from Salem Ohio. I was an EcoWasher® skeptic and now I'm an EcoWasher® advocate. The EcoWasher® PRO model is designed to work for homes with municipal and city water only. The EcoWasher® PRO PLUS model is designed to work for homes with hard water. The EcoWasher® Elite model is designed to deep clean and disinfect laundry for those with regular city, municipal, and specifically hard water.